We all know the arguments against Vickers Village. We’ve heard them before. You could pick the arguments off the shelf of any opposition to development that has occurred in the United States in the past 50 years. The density is too high, the traffic will be unbearable, my kids won’t be safe, the schools will be ruined, my property values will plummet, the building is too big, it doesn’t fit with the neighborhood, it's not historic, I want redevelopment just not this…. The list goes on but in reality, opposition to projects is generally grounded in fear of the unknown and opinion while arguments are often supported by conjecture and hyperbole that isn’t grounded by fact. Now, I happen to think the density is just right, the traffic is coming regardless (are the 100% car dependent subdivisions being built off Woodstock Rd getting this same objection? ), kids will be just fine, the schools will still thrive, property values will do just fine, the building is big but appropriate, it will fit into the neighborhood just fine… and I want redevelopment and I welcome this project. So, I’d like to offer up some thoughts on why I really love this project. 10. It’s MUCH better than what it’s replacing – The modern historic preservation movement really gained traction when Penn Station was torn down to build Madison Square Garden. The fight was fierce but the preservation minded architects lost and a beautiful building was lost to an eyesore. This was a microcosm of a national problem. Beautiful buildings were being destroyed and replaced with meaningless garbage for the sake of profit and modernity. To combat this trend, historic preservation organizations began to pop up all over the nation. Unfortunately, Roswell did not officially have a commission until 1992, which may partially be why we have so much garbage, sprawl-style development throughout the 640 acre historic district. Now, Vickers Village is no Penn Station. But it is light years better than the buildings currently on those properties. The price premium is much greater in for-sale housing (in walkable urban places). In the drivable sub-urban areas of the Atlanta region, homes are valued at $60.06 per square foot; in Established WalkUPs, values are 161 percent higher, at $156.46 per square foot. Vickers Village won't hurt your value and if will probably drive your values higher. I could be completely off base here. But... I'm not. As a homeowner in the historic district, I’m a big fan of a development like Vickers Village in key locations (and this prime intersection is one of them). Also, taller buildings (I guess 4 stories is really tall in Roswell :) next to single family homes don't necessarily kill property values. If the placemaking is done well and the area is desirable, which Historic Roswell is, there is no reason to fear juxtapostion of larger and smaller buildings. Rosemary Beach homes seem to be doing just fine next to a 4 story building. 8. It Breaks Up the Façade – By breaking up the façade with frequent variations in setback and height, it will create the feel of a building that is a collection of smaller buildings. In this case, four stories truly is better than three stories because the additional floor gives the developer the flexibility to build these variations. This project will provide 320 feet of frontage along Woodstock, 143 feet of frontage along Canton and 221 feet along Thompson. There will be one, two, three and four story sections as you walk by. This is MUCH more preferable than a solid three stores all around which is the most likely 'plan B' for the development team. 7. It Mixes Uses – The term mixed-use is way overused but it’s very true in the case of Vickers Village. As proposed, VV would have condominiums, a restaurant, a coffee shop, several offices and a spa. If you want to use land efficiently, that’s how you do it. If you want to build a truly walkable neighborhood, that’s how you do it. If you want to increase your property values, that’s how you do it! 6. It Balances Canton St – On the south end of Canton Street, we currently have what is undoubtedly the best stretch of authentic walkable urbanism in North Fulton. Now, anyone who has been to shopping malls, knows that they don’t build them with just one anchor. Mall developers were cued into human behavior much sooner than post WWII city planners were. That’s why malls always have at least two anchors. People want to walk from one destination to another and the retail in between thrives as a result. Canton Street currently lacks a second anchor area to balance it. Vickers Village will be that second anchor. Vickers Village’s prime building frontage is amazingly close to that on south Canton Street. Pastis to Salt measures roughly 360 feet. Go With the Flow to Tutto measures 160 feet. Provisions to the flower shop measures 210 feet. Now, the retail frontage at Vickers Village will be significantly less than what we have at the south end of Canton street but the total linear feet is almost exactly the same (727 South Canton vs 684 Vickers). So, in my mind, this truly is comparable in size and scale to the south end of Canton Street when you look at linear building frontage. (I obvioulsy understand that VV is taller) This is the anchor development that Canton Street has been looking for. 5. There’s a Plaza! – How many developments in Roswell in recent years have actually reserved space for a plaza or park that the general public will actually be able to use? The only one I can think of is Sloan Street Park which was built when the Bricks were renovated. This will be an incredible amenity and I really don’t think it happens without the fourth story. 4. It Has Underground Parking! – At between $10,000 and $20,000 a spot, underground parking is expensive. It is generally twice as expensive as above ground structured parking which is five to ten times as expensive as surface parking. The developer is doing the right thing here. It’s the right thing to do for the project and it’s the right thing to do for the future of our historic district. Nothing kills walkability like a surface parking lot. Vickers Village really gets it right on this front with the residential parking buried underground and the retail parking covered by the residential and retail. 3. It Increases Road Connectivity – Although this is controversial because the drive would be within the buffer of the neighboring property, it is absolutely the right thing to do for the city. Cities and places with a finer grained road network are more walkable. The more blocks per square mile that a city has, the more choices pedestrians, cyclists and drivers have to get to a destination. More importantly, bigger blocks mean bigger streets and fewer streets. This is critical for safety. The bigger your block size is, the more likely you will see injuries and fatalities on your streets. A study that looked at more that 130,000 car crashes over a 9 year period concluded that a doubling of block size corresponded with a tripling of fatalities in the 24 cities studied. Now, this doesn’t’ mean that smaller block places can’t be dangerous but it does mean they are less dangerous. What it tells me that the best thing we can do to increase the safety on our streets is to reduce our block sizes and create exactly those ‘cut-through’ streets that people seem to despise so much. 2. 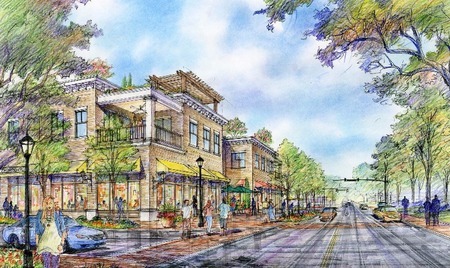 It Focuses on the Pedestrian – With the mix of uses, broken up façade, street trees, plaza, street connectivity, underground parking and wide sidewalks, this could be the most pedestrian friendly project ever proposed in Historic Roswell. It has certainly made it farther along in the process than any other. The only two that rival it are the Duany Plan and the Boutique Hotel on the Square. Seriously, this four story plan is Better choice for the pedestrian experience as it embracing the public realm and caters to the human scale from the sidewalk. 1. It’s Freaking Bold – I personally think the design as is puts that land to its highest ;) and best use. I think teh current proposal is award winning while the alternative will be 'just okay.' We should get out of our comfort zones, embrace change and continue to build on the history of our historic district. Be BOLD! Alas, it probably won’t make it with a fourth story due to a massive amount of community objection. My prediction, city council approves the multi-family conditional use and the buffer variance but does not approve the height variance. With that, I’m sure we will get a project that is good but not bold. One that is much less interesting than the current proposal. I think denying the fourth story is the difference between an award winning project that communities outside of Roswell will look to emulate and a development that’s nice but not special. Ultimately, not everyone is going to be happy. The immediate neighbors are probably going to be upset regardless. As the saying goes, you have to break a few eggs to make an omelet. I say we should give this building the 10 extra feet of height that it needs so we can have a bold, interesting building that will build on our history, create conversation and enhance our historic district.